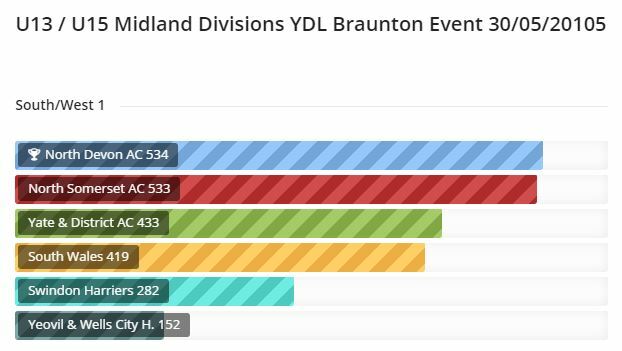 Our breakdown of the YDL event in Braunton 30/05/15. For the team managers Leslie Nunn (girls) and Darren Wells (boys) it’s been a struggle to get a full team, as it fell on schools half term break. but what a team they produced. The athletes that competed covered disciplines that were miles outside of their comfort zones. But all with a smile on their faces (thank you). With travelling by coach for a couple of hours to get to the event, we stepped off the coach to be greeted by fantastic sunshine. Thanks North Devon for booking brilliant weather. What a lovely venue and Club to greet us. Their clubhouse was put under pressure by catering for all but what a gallant effort. It was nice to see a selection of our coaching team at the event to help support their athletes through the events. We all checked in on time so well done, (that doesn’t always happen). Quite a few of our athletes set new PB’s some by a long way (Liam Hillier). What great achievements! After a full on day we then got back on the coach for our trip home, Most had a good sleep to recharge their batteries. Some dad’s even had a good snoring session! Its ok we aren’t going to name and shame them.